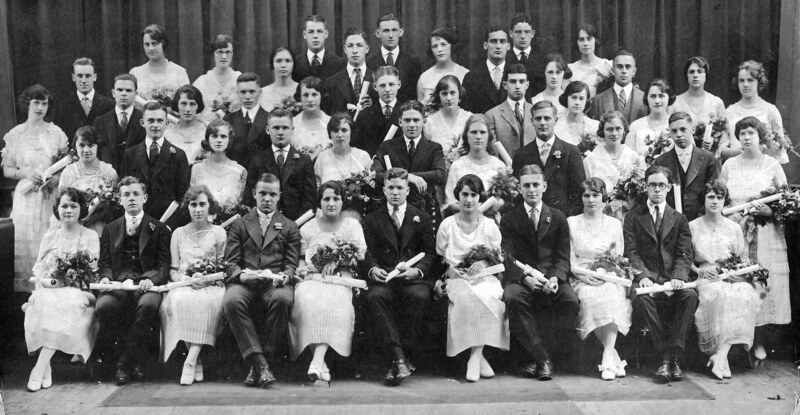 This is the full Lansdowne High School graduating class of 1920, all holding their brand new diplomas. (Click to enlarge.) The first rows are neatly arranged boy-girl, boy-girl, ankles crossed left-over-right (some guys never learn left from right) and the girls all in white dresses, holding bouquets. By the third row, time must have been running short and the late-comers were told to fill in wherever they could. I assume they are being photographed on the high school stage, the same stage we saw each week at junior high assembly in what we knew as the Highland Avenue School. My father, at age 14, is the youngest graduate of Lansdowne High School then or since. He is on the second row, second from the right, poignantly looking very young and very much out of place. Either girl next to him could pass for his mother. He did not graduate so young because of any special talent and never mentioned it himself. His parents expected their children to enter the working world and contribute to the family’s welfare as soon as possible, and they pushed him through. In those days, parents decided what grade their children would attend. Education, in their view, was an effete indulgence of the rich. My father never talked about his high school days, of any teachers, activities, or friends. I don’t think he had any school friends, being so much younger than the others. His social life seemed to be centered around the Methodist church on the corner of Washington Avenue and Springfield Road in Clifton Heights, only a half a block away from his home, where he played basketball in their basement. Children of those times often identified more with their neighborhood church than their school. He grew up in Clifton Heights while working at Kent Mills, a woolen mill in the deep valley of Darby Creek just on the other side of Baltimore Pike. Clifton Heights, aptly named, really was perched on the heights of the cliffs along the valley. For a while after the actual mill closed, the owners maintained a retail store in a former bank building along Baltimore Pike, and my first suit had their label. The original mill location is now a dog park surrounded by housing developments. When Darby Creek floods, as surely it must, I pity the poor residents. While working at Kent Mills, probably still a young teenager, he caught the ring finger of his right hand on a nail, and it remained misshapen for the rest of his life, although it did not handicap him in any way, even when playing the piano. That happened before today’s worker’s compensation laws. To my knowledge, Clifton Heights never had a school system of their own. Lansdowne High (at their old location on Highland Avenue) was only a little over a mile away and my father must have walked or biked there alone each day along wooded Baltimore Pike. Even Gladstone Manor was not yet built. Since he never spoke of his high school days, this photo is all I have, but it explains a lot. He was surely aware of his exclusion from the typical high school experiences and pleasures enjoyed by his older classmates. This entry was posted in History, Lansdowne and tagged Baltimore Pike, Clifton Heights, Darby Creek, Gladstone Manor, Highland Avenue School, Kent Mills. Bookmark the permalink.